We all have inside of us the power of knowing, or an inner voice, otherwise known as intuition. You must develop your intuition to hear it more clearly. Intuition tells us which direction to choose, to know whether to say yes to the job or the man or the move, to know whether we should see the doctor or wait it out, to know what feels good and what doesn’t. Intuition is our conscious connection to the great spirit, the force that knows no doubt. Intuition is likely what made me do a self-exam and find the lump when I was 27. Intuition is what made me move to Hawaii after college and enjoy the most heart-opening experience of my life even though I was scared. Intuition is what led me here, right now, to this beautiful, peaceful farm outside Eugene even though my lower mind told me to just stay in Arizona because I didn’t need to go. And this is the crux of it all, intuition sometimes has us do things that don’t make sense, that we don’t have to do, or that our lower minds consider silly. Life can be either very logical or magical—directed by a higher purpose—depending upon your viewpoint. Our experience of life is determined only by how we look at it. I’ll choose magic every time. 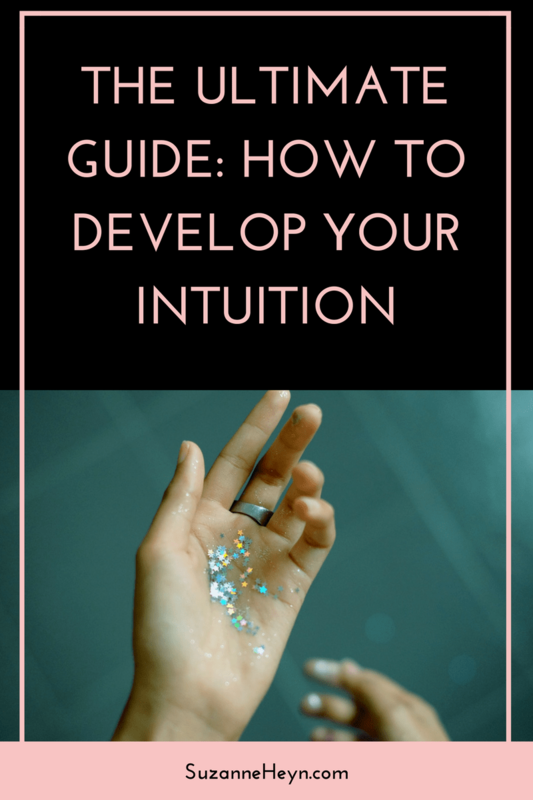 This may sound obvious, but the most effective way to develop your intuition is to use it. If we don’t, it becomes quiet and difficult to hear. But take heart, holding the mere intention to listen increases your capacity for receiving its messages. Work to identify the feelings you have. Does one decision feel joyful or expansive while another makes your chest feel heavy? Follow the decisions that feel expansive. Do you naturally gravitate towards certain things but doubt yourself because you value thorough consideration and analyzing? Sometimes our first, off-the-cuff impulse is the best one. Try following that gut feeling and use the results as a way to calibrate the inner guidance system. Our consumerist society relentlessly consumes not only material goods, but also information goods. Information is power, but it easily turns into overload. To develop your intuition, spending time alone with your heart and mind, without television, the chatter and expectations of others, even without books, is super important. All the answers we need are within. Journaling – Start by writing “I feel” and free write. This is an excellent way to channel your higher truth. Do something that involves little more than you and your breath. Take the time to interact with your intuition like an old friend that you’re seeing after a very long time. Open yourself up to new information and be ready to make small adjustments that are asked for. Meditation powerfully calms the mind chatter and helps you develop your intuition. By focusing on the breath and finding that place of quiet peace inside, you begin to learn what truth feels like. You start to feel what truth feels like — a knowing in your bones that is beyond rational thought. Download the meditation technique I used to change my life below. 4. Practice by starting small. Develop your intuition by asking for help with simple tasks. I recently wrote on Instagram about designing quote graphics and changing the colors of my website, which you may have noticed. On the surface it was about finding a look for my blog, but underneath was something much deeper: finding out who I am right now, my preferences for colors, styles and shapes. Our preferences and tastes are part of us, and in this small way, by constantly asking, “do I like this color or this color?” I began to understand my preferences right now and tune into the deeper part of myself that is connected to my intuition. Lacking clarity about life’s simple things is a sure sign we’re out of synch with ourselves. How do you dress? Do you dress based on the trends you see in the mall, fashion magazines and social media, or can you look in your closet and figure out how to dress that day by how you feel? Understanding how you feel at any given moment in time and developing the ability to respond to that by creating your reality is part of fine-tuning your intuition. This sense can carry into food too. I recently started eating meat again, and that decision developed from an intuitive idea that I needed animal protein for increased energy. What foods do you need for optimal nourishment? If you are feeling tired or out of synch with yourself, ask the question: “What do I need right now?” Be open and gently listen to the answer. It may surprise you. We have many voices inside — the voice of doubt, of fear, but our intuition, the voice that knows no doubt, tends to be quieter, less frantic. It takes practice following the guidance to sharpen this internal compass, to learn which voice is the one of our authentic intuition and which ones are fear or hubris masking as truth. As you practice following this internal voice, you’ll learn the tone, and the guidance will grow louder. This is how you develop your intuition. Intuition is sometimes a thought, sometimes a feeling, perhaps an image for some people. It can be difficult to discern when fear is fear and when it’s intuition. One powerful way to develop your intuition is to tune into whether there’s desire underneath the fear. For example, last year I traveled to Costa Rica. It was my first international trip alone, and I was really nervous. I almost cancelled the trip I was so scared, but underneath that fear was a more quiet assurance: go, you’ll be fine. Another example, I once accepted a promotion at work even though my intuition told me not to. Friends and family told me the opportunity was a great one, that I could always quit. The experience ended up being really horrible, but good things still came out of it. So even if you mess up, nothing is all good or all bad. Most of the time, the stakes are not that high and everything works out in the end. Ultimately, this is an art and about getting to know your true self. The more you know your true self, the more courage you’ll have in following your intuition. Making mistakes is sometimes the best way to learn. So just dive in! What experiences do you have from following or ignoring your intuition? Share your experiences in the comments below. Did this article resonate with you? Share it with someone who needs help developing their intuition. They’ll appreciate you for it! I’m so glad the article resonated with you! I’m so happy that you’re back on the path to connecting with your intuition. What a wonderful journey you’re on. 🙂 Thank you for the kind comment, and letting me know you found the article helpful! I appreciate it so much.